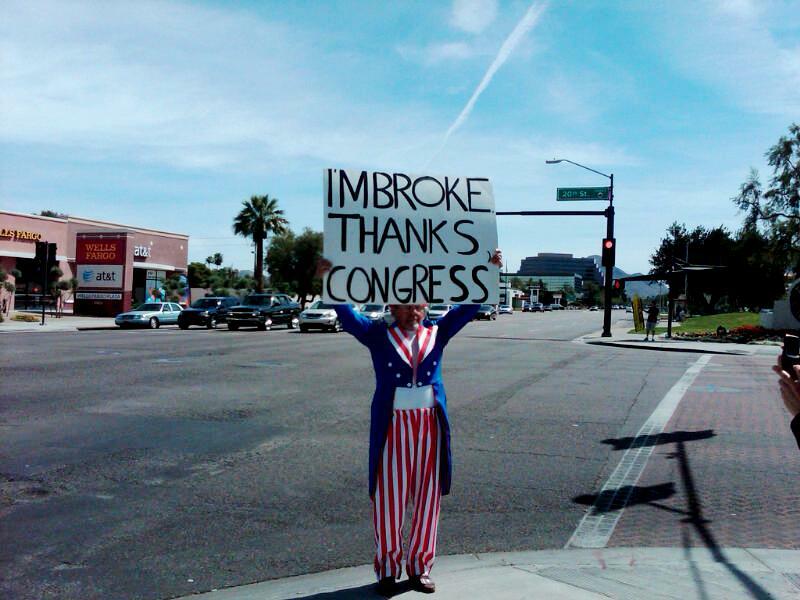 He Protests: "I'm Broke Because Of Congress"
Actually I've been thinking Congress is "criminally insane" but I get his point. I'm not sure what his specific argument is but he gets significant support from traffic and people stopping to take his picture. He is very congenial. 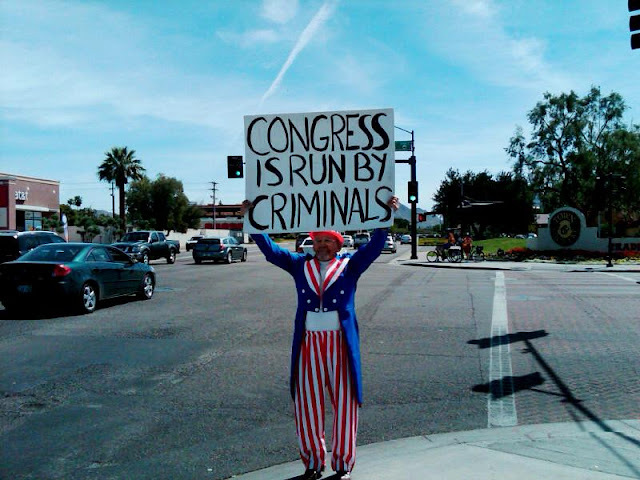 Personally I feel the political class on all fronts, Congress, the Administration, political parties and the bureaucrats who run the arcane agencies of our government, have lost accountability. I find this unacceptable and it's unclear to me the resolution but I know I'm intent on figuring out my responsibility. Think about our rights of speech and assembly, urban public space, movements for social justice and protest. Has public space been so secured to protect us from terrorism, that we have lost valuable rights? These issues affect both the political Left, the Right and everyone in between. Why do people who hold different positions think it's acceptable to mock each other when the other side speaks out, when in fact, we're all exercising US Constitutional and historical rights, now mitigated by courts and law? To mock is to belittle your own right to speak out. I have a good friend who is Marxist leaning and polar opposite from me in economic, political and social beliefs but we made a separate peace a long time ago. It is based on respecting each others right to express what we believe out loud in public. How that plays out if it comes down to the nitty gritty, we will only know if it happens.